The charts below show the number of Japanese tourists travelling abroad between 1985 and 1995 and Australia’s share of the Japanese tourist market. This chart shows us that Japanese tourists go abroad for travelling in a decade and Australian’s share of marketing for Japanese tourists. 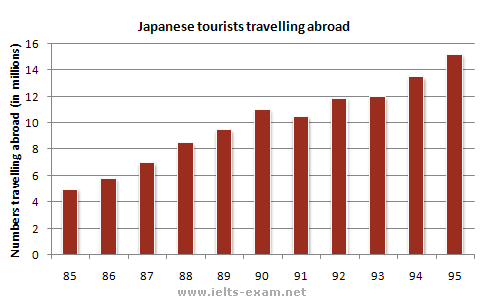 Between 1985 and 1995 Japanese tourists travelling abroad was dramatically increased. In 85 there was about 5 milions traveller go abroad. Since 85 number of traveller went up dramatically until 40. It was alomost twice then between 90 and 93 the number rimain stateable, which is about 12 millions. From 93 to 95 it rose slightly. Therefore in 1995 there were about 15 millions people went abroad. 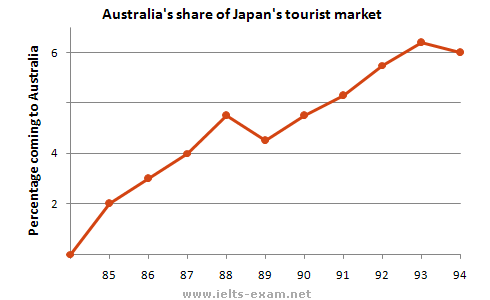 I am going to write about the other chart, which is Australian’s share of Japanese’s tourist market. This is also between 1985 and 1995. About 2 million Japanese tourist went to Australia in 1985. Between 85 and 89 people went there is increased sharply, which is almost 3 times more. In 1990 it fall number slightly but from 90 to 94 number is went up. However 94 to 95 is not so went up number of people who went to Australia. It rimain is the same or slightly decreased. The writer does what is required of her in terms of task fulfilment, and the message can be followed, but the weaknesses in grammatical control and in spelling cause difficulty for the reader. Complex sentence structures are attempted, but the greatest levels of accuracy are found in basic, simple structures.